Spring has sprung and summer is on its way! This time of year makes many want to get their golf clubs out and hit the golf course. As you may know, golf can become addicting no matter how great or how “not so great” your game may be. As a financial professional you probably find little time to enjoy a golf game, and would love the opportunity to be on the course a little more often. Have you thought of using golf as a client appreciation event? The truth is that if you don’t appreciate your clients, someone else will. Many professionals have used the competitive and social opportunities offered in golf settings to establish new relationships with prospective clients, and establish stronger relationships with their current clients. This is a great way to set yourself apart from other financial professionals, and leave a good lasting impression with them. Client appreciation events such as this one are important because they help set the financial professional up to get referrals from a stronger and more loyal client base. Your next question may be, “how much is this going to cost me?” The great news is you can spend however much you want to on the event based on your budget. Look at inviting four or five of your best clients and set up an hour long golf lesson with a local golf professional. 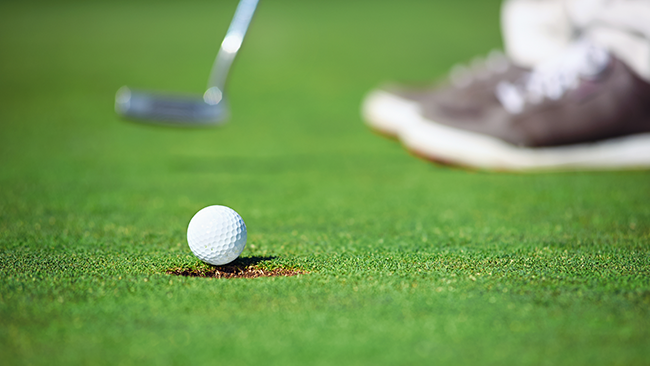 Make sure to tell the golf pro you want to make this event memorable for your clients. The golf pro may have some free promotional items such as apparel, a free round of golf, another free golf lesson, club house gift certificate, etc. Remember to thank your clients at the end of the event and ask for names of friends that might also enjoy coming out for a golf lesson. Do a follow-up call for more information, this will help determine the best prospects/referrals. This one will cost a little bit more, but will create a bigger buzz with your clients and you can incorporate a prospecting opportunity in the same event. This time when you invite your top clients have them invite a friend along. Hold the event during the weekend and do it in the morning if possible—this will allow for better availability. First, schedule a golf lesson followed by a round of golf on you as a “Thank you.” At the end of the event, ask the friend that came along with your client if they might know of someone that would enjoy an event like this. They may be willing to give you some names. If your budget allows for it, this one will make an enormous impact and lasting impression on your current clients and new prospects. Have an annual golf outing were you invite a total of 24 golfers (include current clients and new prospects). Depending on how big and how much you want to spend you may decide to give away golf balls, towels, hats and even tee packs that are imprinted with your logo. Have the golf course work with you to create “hole” events such as closest to the pin, longest drive and others. Try to include different carrier merchandise from the carriers you submit business with. If you can leverage your carrier relationships, ask one of the carrier representatives to sponsor part of your event. After everyone has finished up their round you may want to have the golf course serve a lunch or dinner topped off with some prize giveaways and trophy presentations. Please remember that various state insurance regulations, as well as other state regulators prohibit the “gifting” of items, or inducements, which may include entertainment expenses, marketing or other activities (e.g. client appreciation events, etc.) by financial professionals in excess of a certain dollar value with some of those limits being as low as an annual aggregate value of zero dollars. Be sure to check with your state’s requirements and/or your firm to ensure that you are complying with your specific state’s requirements and guidelines. Don’t try to pitch or sell during the event; this is about showing gratitude and building lasting relationships. However, if someone asks you something that is business-related, converse it at that moment or schedule an appointment with them to discuss it later. Don’t bring up insurance during an event like this because you don’t want to make anyone feel uncomfortable. Use the power of golf to create a memorable client appreciation event and prospecting opportunity, and let the client initiate the business related conversation. Don’t underestimate the importance of golf. Golfing allows you with the opportunity to build new relationships and establish closer relationships with your current clients. While golf can be time consuming, it does offer an atmosphere for people to get to know each other, and for you to create a lasting impression on your clients/prospective clients. Whether your clients or prospective clients are avid golfers or new at the game, the thing you must remember to do is to follow through with your promised email, text message, phone call or visit. So if you are ready to take your business to the next level and have fun while at it, start planning, and hit the links!